Creative and Resourceful Tablescape Design & Styling E-Course is Open for Enrollment! I have a very exciting announcement! My new Creative & Resourceful Tablescape Design and Styling E-Course has launched! Setting the table is one of my favorite parts of putting on an event. I love bringing all of the essential functional and decorative details together in a creative and thoughtful way to make each guest feel special and well cared for. In the past 20 years in the hospitality industry, specifically almost a decade as an event planner/designer, it’s safe to say that I’ve set quite a few dining tables! I’m so excited to share the knowledge I’ve acquired over the years not only with my wedding and event clients, but now with all of you! As event professionals, whether event planners and designers, catering teams or venue managers, we hope to set the most fantastic tables possible for our clients. But sometimes budgetary constraints prevent us from going as BIG as we’d like to with fancy upgrades. So how can we take our tablescapes from “meh” to “spectacular” without spending a bazillion of our clients’ dollars? How can we think outside of the boring but budget-friendly box of white rim china, standard silver, libby glasses and poly-cotton linens and share work that’s a bit more creative and memorable? 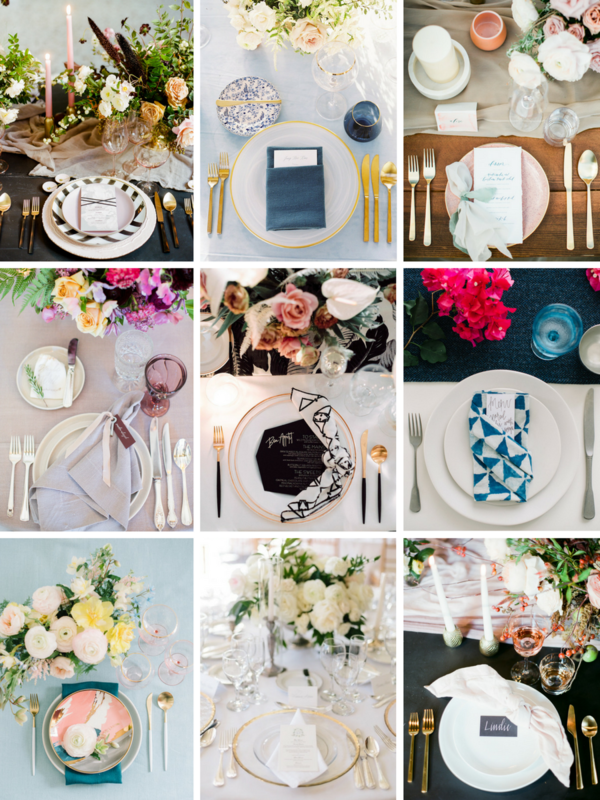 After putting so much hard work into designing a tablescape, how can we visually capture and preserve our tablescapes to get noticed both on social media and with editors at wedding and event publications? Guess what, I have the answers! 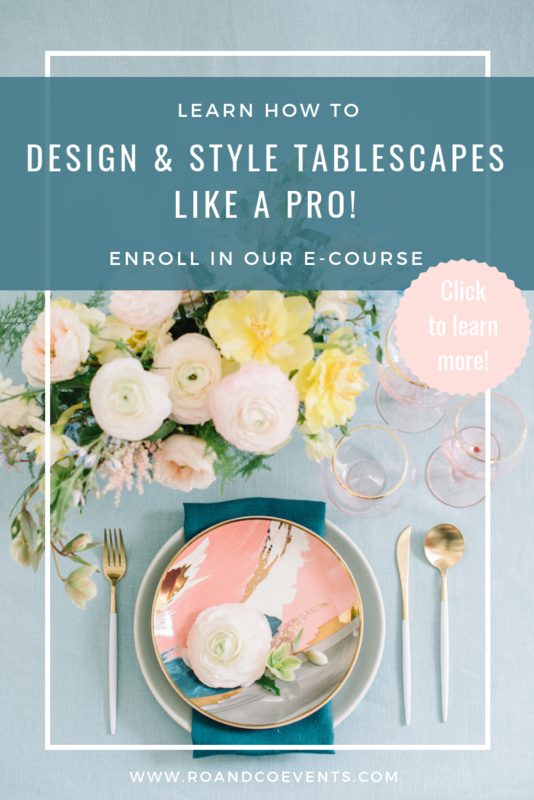 I’m so excited to put my knowledge into an online e-course for you called Creative and Resourceful Tablescape Design and Styling: creating beautiful, content rich tablescapes at any budget! We’ll go over the Dos and Don’ts of tablescape design — what to NEVER include in a dinner table photo! I’m including tons of examples of my own events and talking you through the upgrades we made and the styling details we employed to make our clients’ tables memorable, spectacular and publish-worthy! I am sharing content and quality tips and tricks you can employ to get your work noticed by editors and published. I know because my work has been featured in the top wedding and lifestyle publications including: Martha Stewart Weddings, Brides, The Knot, C Weddings, Refinery 29, My Domaine, Glamour, Style Me Pretty, Green Wedding Shoes, 100 Layer Cake and many more! This course is jam-packed with valuable info and will be a benefit to so many groups of people! Enroll in the course HERE! You do not want to miss it! Hope to see you all in “class” soon!